At this point in the Airbnb Experiment, I’m pretty satisfied. I think I’ve made the right choices, and certainly put in the work to make this project an eventual success. I should be happy with how many bookings I’ve got this year. Four guests have stayed already and many more to follow, particularly this summer. All the fun stats are now on display on this blog’s right nav bar. It may be an obvious point, but man, these vacation rentals are a heckuva lot more work to manage than our long-term rentals. Yeesh! If I didn’t have time for social media before, the Airbnb condo is making it downright impossible now. What kind of “work” is involved, when you’re hundreds of miles away from the actual premises? Allow me to explain! It’s not much, but you need to remember to do this every time. And with Airbnb, you might have 3 or 4 different guests in a given week. My minimum stay is 2 nights, so it could easily happen, at some point. 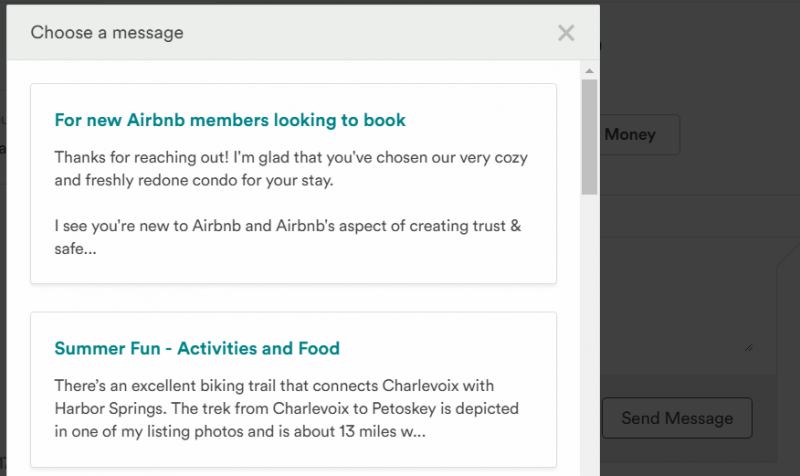 Thankfully, Airbnb has a few tricks up its sleeves to help us noob hosts out. The “Saved Messages” feature is super helpful. It allows you to keep a set of templates for just about any situation. Just swap out the names and the rest of the content can be sent off as boilerplate. There’s also a bit of back and forth that can happen during a guest’s stay. Sometimes a guest simply likes to have someone to text with. Must be a social media thing, I dunno. I had a guest a few weeks back who couldn’t stop gushing about how awesome the place was, which was music to my ears (eyes), but after a few more messages asking “where did you buy this piece or that piece?” it started to get old. After a wonderful couple of days at Cubert’s Magic Kingdom, I send another message, as a friendly prod to prepare to check-out. I set 10AM as the check-out time, in case I get new guests arriving the same day. This allows the cleaning person a healthy window to reset the place. However, during this slower season, I’m letting guests linger for an extra few hours if they’d like to. These small gestures add up. Wow. That little note wasn’t too shabby, actually. I just saved that one over on Airbnb for future use. Easy peasy! I’m fortunate to have a pretty reliable cleaning person on the case, but she’s not always able to get over there the day of check-out. This is somewhat worrisome, because I’d like to be sure there aren’t lights left on, or appliances (stove/oven/fireplace/bath fan) left on unnecessarily. She’ll generally get in within 48 hours, and we haven’t run into any big problems just yet. The worst of the first batch of guests chose to leave ALL the lights on, including the electric fireplace, for God-knows-what reason. And, they figured it a good idea to take an entire pack of make-up remover wipes with them. Maybe that’s karma for our habit of sometimes taking those little bottles of shampoo from hotels that we’ve stayed at. But taking that sh*t from an Airbnb, in Costco quantities?? C’mon!! You just need to grin and bear it. I had jumped the gun, and given this guest a 5-star review, and she had done likewise in return. I would’ve still given a good review, even had I known sooner about the lights and swiped wipes, but my commentary would’ve included some flags for future hosts. Lesson learned – wait until the cleaning person or property manager does a walk-through, before leaving a guest review! DUH!!! Just like all guests aren’t equal, neither is the cleaning that ensues after each stay. Sometimes it takes my cleaner two hours, and other times three. Not a big deal. However, I give my cleaner a $25 bonus for every 5-star review we get for cleanliness. That means a three-hour job could run me $100. In addition to coordinating the cleaning action, and making payments to my cleaner via PayPal, I’ve got to work with her to stay on top of stocking supplies. Simple things like toilet paper, paper towels, tissues, soap, and what-not get used up fast as you churn through guests. I also have my cleaning lady put out a bottle of wine for each new guest. Whew! Thankfully, I can count on my parents to help with Costco runs to help keep the place stocked. So far, the return on investment is in the negative, about -10% cash on cash returns. Same as if you took $30,000 and invested in the stock market, and it tanked 10% by the end of 2018. I’m not discouraged though. Yes, the cost to set up the pad was almost 25% more than what I had planned for ($15,000 v. $12,000.) And yes, I hadn’t taken into account the extra fees I’d owe to the listing aggregators (3% cut goes to Airbnb.) Oh, and I’m using Beyond Pricing to help me automate pricing – thanks to a tip by the Financial Panther. That’s another 1%. Sometimes it feels like death by a thousand cuts. All that said, I’ve only booked 50 nights so far this year. There are still almost 250 nights left in 2018. PLENTY of opportunity time left to reach my initial goal of an ROI of 18% this year. Frankly, I’d be happy with an ROI of 10% for this inaugural 12 month period. A 10% return is respectable for any investment. And I know that with more experience, good reviews and additional effort, this place will yield very nice returns. As for the “part-time job” quip? Yeah, it is extra work, but as I get smarter about things like “saved messages” and settle into a routine, it’s gotten easier. And hey, I’m almost within 500 days of my early retirement goal. Gotta think of things to keep from getting bored then, right?!? If you’re interested in visiting the most beautiful part of Michigan, check out my listing. Let me know in your reservation request that you found the pad on this site, and I’ll offer a 10% discount. Oh, and if you’re new to Airbnb, sign up here to get some credit (40 bucks!) on your first trip! Yep and I can tell you as someone who has rented lots of AirBnB places that I often look at the number of reviews as an indicator of whether I should stay at a place. I think the more reviews you get the easier it is to attract more renters. Heck, you may even be able to raise your rates! Appreciate that vote of confidence, Double-F! I’m still nervous cuz most of the prime time slots are already filled. But, I’m pretty sure autumn will be fruitful. And by then, to your point, more reviews to support the cause! We stayed in an Airbnb in Kona last November where cleanliness was questionable. We would never go back because of it. It’s too bad because the view was awesome and the apartment was pretty nice overall. I think paying your cleaning staff a bonus is a great incentive. Oh man! How bad was it? Were there cockroaches? Only one of the issues! Gross! What were the other issues? And what explanation did the host offer you? How many hours a week are you hoping the AirBnB “job” to be once things have settled down? And I’m not sure if you have this noted, but the last place I stayed actually listed out specifically on the check out procedures to turn off all lights and appliances – maybe that could help those oddball folks who don’t think to do that automatically? I’d say that was a throwback to hotel stays,, but don’t you at least turn off the lights regardless?? You know, it’s really not that much. I figure it to be maybe a couple hours a week during the low season, and as much as four to five during the high season. Even that may be a stretch. We’ll see… Agree with you on the procedures – I have a saved message now with clear expectations about lights and appliances. Sometimes the obvious escapes people I guess! Wow, that sounds like a lot of work. I’m thinking about convert a basement into an Airbnb unit. I’d like to try it out for a while and see if it’s worth the time. Even if it doesn’t make much money, it will increase our property value. Go for it! I would consider it myself, but with the two kids now in the mix, it’s not going to happen. I think if you’re single or without kids, it’s a great income generator. A quick recommendation – use Aviva IQ to automate some messages. I set it up to give a welcome message a day before my guests arrive with a link to my house manual and info about the quirks of my house. On the day they leave, I have an automated message sent out that reminds them to lock the door and leave the key for me. This really cut down my virtual concierge time, since I really don’t have to do anything else besides those two messages. Aviva IQ is free, so definitely worth using. Use hostfully for an online house manual. I get a lot of good feedback on that. You might have mentioned that to me before, Kevin. Thanks for the reminder! I will check that one out next. Great tip! I’ll check it out too. Thanks! Would be great to have our house not costing us any money while we are away. That being said, we are not too worried about comments (no long term implications), but do want to make sure everyone get’s treated well when they are there. Still need to make a booklet of some sort for the guests too now that I think about it. Thanks, Cheesy! You are super smart to set up your home for Airbnb guests during a long duration away. I am on the fence about others sleeping in my bed. If I can get over that, we might reconsider trying the same down the road. Heck, I need to get over using my own vacation rental come this summer!!! I know. I know. 🙂 I’ll find out if I have some Howard Hughes phobias going on when we stay later this summer! Yes, the time to manage all the little details, even virtually, adds up so much more than I thought it would too. I love the idea of giving the cleaning person a bonus for every cleanliness-related review! 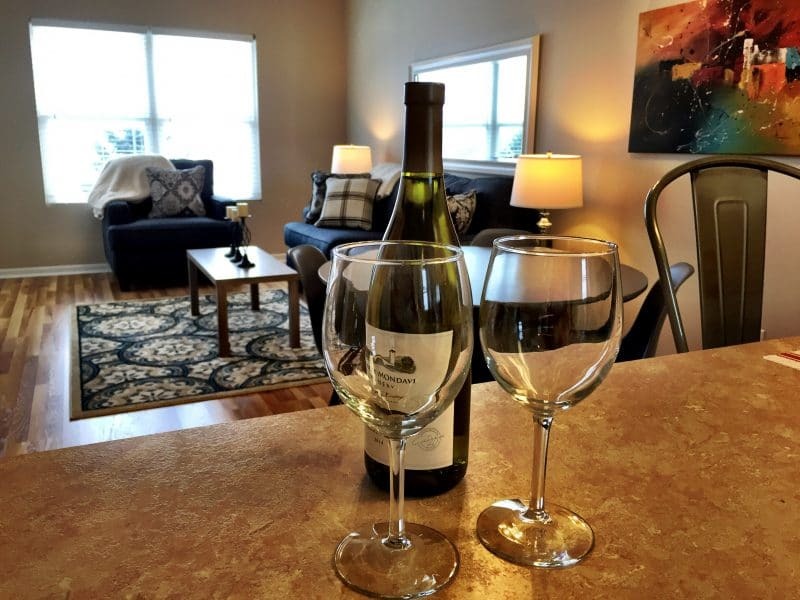 We manage a rental on VRBO right now and I’ve been curious about AirBnB. Are you using the Instant Booking feature and if so have you had any issues? Hey Sarah! Ditch that desk, ditch that cube! Are you the Robin to my Batman, or the Batman to my Robin? Welcome, either way!!! I keep driving by a condo on the way to work that’s for sale…I can’t help but think how it would be in the perfect location for an Airbnb guest, or also tenants. So the whole time I’m reading your article, I’m actually picturing it the location of this place! I do question some of the condo neighbors though (I tried not to deep creep/be too stalkerish). I see carelessness/some deterring factors they may not be the best people in the world which, would also be a concerning factor when considering property rentals. I have a coworker who is operating the #1 ranked Airbnb in a city. His stories are also intriguing, and what he goes through to keep getting those 5 star reviews. Even having his mom sew curtains to match the other pieces of furniture and decor! And his dad is on site to be the handy man/fixer upper at times. Operating one from a distance without being physically there (to micromanage it!) or having people you trust to oversee it would give me anxiety…kudos to you brah! The dream is possible and can offer another income stream that would pay off in the long run while being retired is worth it though in my opinion! Thanks for sharing your experience! I had a similar experience with being a landlord – I had the idea in my head that after leasing it’d just be collecting a check and I too found a lot of responding to emails required, little things here and there I didn’t account for and all of a sudden it had turned into a part time job. Articles like yours help put into perspective exactly how much work it is. You bet! It’s surprisingly a lot of work. Even if you have good people on the ground (cleaners, maintenance, and so on) you still spend a good amount of time coordinating. Good luck, MC!